When Governor Cuomo talked about the “toxic cocktail” inside of the L-train tunnel, he definitely wasn’t talking about the hot new drink. But, go figure, there’s now an L-shutdown-themed beer. 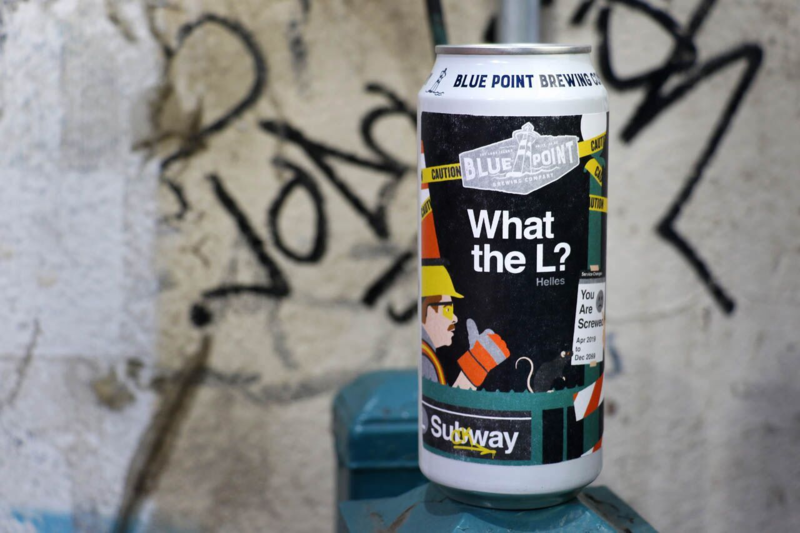 The new brew, dubbed What the L?, will be launched by Blue Point, the brewing company that just threw a free Matt and Kim show at Avant Gardner. In April, they’ll give even more love to Williamsburg– the neighborhood where Vice’s Old Blue Last was born— with a helles-style, 5.2-percent-ABV lager. If the label art looks familiar, it’s because it was designed by Winston Tseng, the graphic designer who put up those fake “Your Train Is Delayed” posters in the Bleecker Street subway station. He’s also the guy who trolled Trumpers by wrapping an East Village garbage bin in a “KEEP NYC TRASH FEE” PSA. Of course, there’s no drinking on MTA trains or in subway stations. But with the Times saying riders are stuck in transportation purgatory” and the Post saying that a new MTA mitigation plan amounts to straphanger hell” (Cuomo says the plan seen by the Post is out of date), you’ll probably want to brown-bag it.